Create a farmhouse-inspired dining space with this round drop leaf table. Sized right for smaller spaces, the table features a two-tone finish with antique white finish for the base and a plank-look rustic brown oak veneer table top. Two open shelves add bonus storage to the table. With a grayish brown textured fabric on their cushioned seats and casual slat backs, the dining side chairs have a simple appeal. Their antique white finish offers a fresh farmhouse design style. 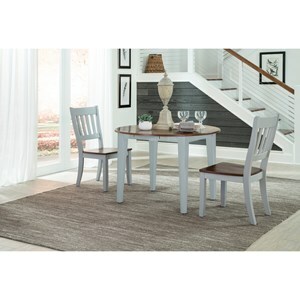 The Bardilyn 3-Piece Two-Tone Drop Leaf Table Set by Benchcraft at Virginia Furniture Market in the Rocky Mount, Roanoke, Lynchburg, Christiansburg, Blacksburg, Virginia area. Product availability may vary. Contact us for the most current availability on this product. The Bardilyn collection is a great option if you are looking for Casual Cottage furniture in the Rocky Mount, Roanoke, Lynchburg, Christiansburg, Blacksburg, Virginia area. Browse other items in the Bardilyn collection from Virginia Furniture Market in the Rocky Mount, Roanoke, Lynchburg, Christiansburg, Blacksburg, Virginia area.